Raising a teenage daughter can be difficult! 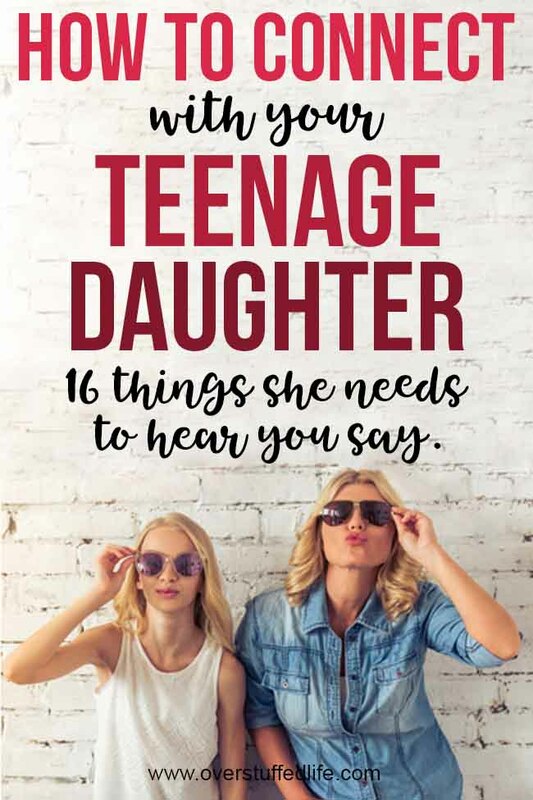 Connect with your teenage daughter by making sure she hears these encouraging words from you often. Navigating the teen (and tween!) years can be rough for girls. 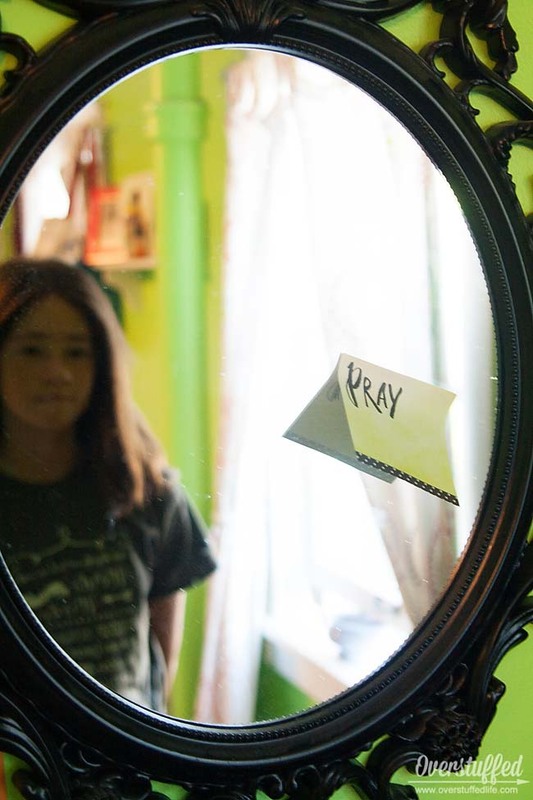 Their lives, bodies, and social circles are all changing at a rapid pace. Friendships that were easy in elementary school become difficult in middle and high school. Academics become more challenging and time-consuming. There is more responsibility at home, they may have a job, and their extra-curricular activities become more and more demanding. It's a lot for a girl to handle! The teen years aren't very easy for parents, either. Every day I send my children to school where I hope they will learn, work hard, and become better people. But I'm also sending them into an environment where not everyone shares their same values. They witness their peers make poor choices on a daily basis, and sometimes it's hard not to get caught up in those bad decisions themselves. Parenting teenagers is a whole different ball game than parenting young children is. I'm learning as I go, and I have made a lot of mistakes. But I have learned that my daughters need love and encouragement from me more than anything. 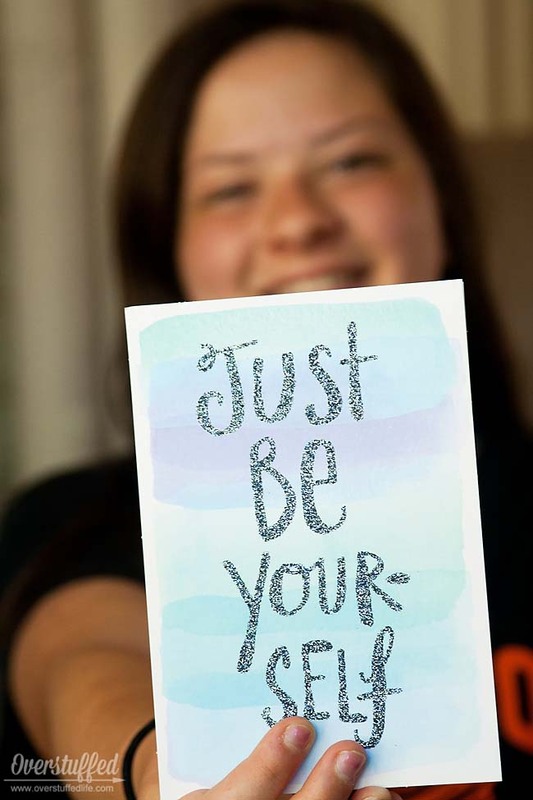 The teen years are a time to step back a little and allow them more independence, but to also quietly encourage and solidify the values and lessons that will make them strong adults someday. The quickest way to destroy your relationship with your daughter is to never apologize or admit your weaknesses. I mess up with my kids on a regular basis, and I try very hard to go to them and apologize and talk it out. Because I've made a point to do this their whole lives, they tend to forgive me quickly and we move on. I also think that they find it easier to apologize and recognize their weaknesses because my husband and I have set the example for them. 2. I love you no matter what. She may not say it back, she may act like she doesn't care, but she needs to hear it. Find as many ways to say it as you can—with a kiss and hug, with a note on her bed, with her favorite meal, with actual words—just don't forget to say it. And make sure she really hears that "no matter what" part, too. I've watched my daughters try to be someone they are not because they are worried about not being able to fit in. Chloe had a super rough first year of middle school last year, and she was definitely not herself. During the first month of summer, when she had been away from some of the poor influences long enough to start finding herself again, she mentioned that she didn't know why she was acting a certain way. I told her that she was being Chloe again, and that I loved it. She pondered this for a while and then said, "I like being Chloe." I hope she remembers that forever, because I like it when she is Chloe, too. This goes right along with being yourself, but needs its own category. Emphasize to your daughter that wherever she is in her life journey, she is enough. Help her learn to compare herself against herself and not her peers. Help her see her strengths, because she is loaded with them. She will mess up, and she will mess up a lot. It doesn't matter how big or small the mistakes are, she must learn to forgive herself, even while asking forgiveness of the Lord and of those around her. Teach her to extend mercy to herself as well as to others. 6. Your family loves you. During the teen years friends begin to take precedence over family. It's normal, but it is so important that our children understand that their family—parents, siblings, grandparents, cousins, aunts and uncles—will always be there for them. My mom used to tell me on a regular basis, "Friends come and go, but family is forever." Yes, I rolled my eyes at her, because I wanted to go out with my friends instead of doing whatever family activity was planned. But she was right. 7. You can do hard things. This was our family theme during Bria's first year of middle school. I was surprised by how much she internalized it that year, but to this day she is confident that she can do hard things. And when she isn't, I just remind her that with the Lord's help she can do whatever is asked of her, no matter how hard. This summer she decided to test out of sophomore English so she could devote time to other classes. It's been hard. She's beginning to fret about her ability to finish the work and pass the test in a couple weeks. 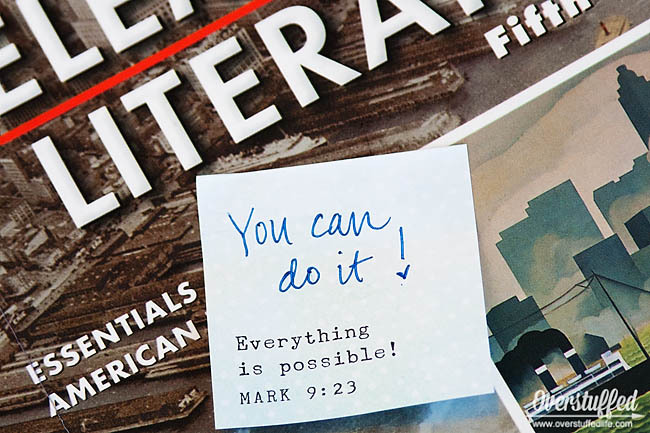 So I left her a little note on her textbook reminding her that she can do it. And I know she can. Occasionally my daughters start to freak out about various things in their lives. I have learned that it is better not to give them solutions because their knee-jerk reaction is to reject my idea and lament that I don't understand. When I ask how I can help instead, it usually causes them to reflect and come up with some really great solutions. Sometimes those solutions involve my help, and sometimes they don't, but just knowing I am willing to help them the way they want me to help them is comforting to them. 9. You don't have to do it alone. It's lonely in teenage land sometimes. It's important for her to know that it doesn't have to be. Not only am I willing to help, but so are a lot of other people. And so is her Heavenly Father. Help her remember that with the Lord by her side, she will never be alone. Remind her to pray, to really talk to her Father in Heaven. Pray with her. And, most of all, pray for her. 10. I am thankful for you. Let her know how grateful you are that she is part of your life. Let her know that you are thankful for specific things about her. Let her know how much she enriches your life. 11. You are a daughter of God. My daughters are only on loan to me. They are daughters of God, and it is my responsibility to make sure they know that. They are created in His image. They have a divine nature and an eternal worth. Tell her that God loves her—no matter what. And not only does he love her, he knows her. He is aware of her. She is valuable to Him. 13. It's okay to walk away. It's okay to walk away from friendships that aren't good for her. It's okay to walk away from those who are asking her to make choices against her values. It's okay to walk away when she finds herself somewhere she shouldn't be. Teach her to walk away from the bad influences and walk towards her family and towards God. You will all be waiting with open arms. 14. You can talk to me about anything. Anything. I'm working on not flying off the handle when my girls tell me something upsetting. It's important for me to be able to talk through things with her calmly. It's also important for her to know that she can trust me. 15. Let's go out for a hamburger. Make time for just you and her to go out and do something fun and just be together. Go see a movie, go out to eat, go shopping. Just do something. These outings are a wonderful time for her to open up and tell you what's going on in her life—especially if there are other kids at home. 16. You are more important to me than ___________. When I was a teenager I had a small problem backing out of the driveway and I sideswiped my mom's car. She happened to be watching from the window and started yelling to me to stop. Then she came out to the driveway and she was mad. But then she immediately apologized to me and made sure that I knew that I was more important to her than the car was. I appreciated that lesson, and I hope that my own daughters know that they are more important to me than work, the computer, sleep, or whatever else tends to take up my time. One of my favorite ways to make sure my girls are hearing these important messages is by leaving them notes. I love to write cards for them or leave little notes in their school bags and lunch boxes. They rarely mention them, but if they were anything like I was as a teenager, they keep them in their journals and read them often. I still have notes my mother wrote me in my important papers. They are something I keep close to my heart. 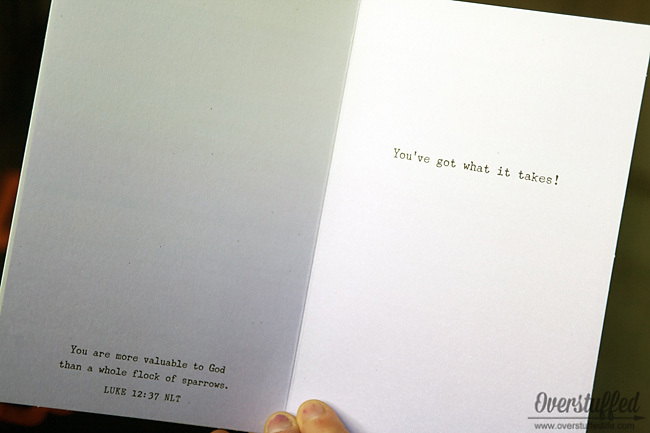 I love Sadie Robertson's new Live Original stationery line. I picked up some beautiful greeting cards and fun sticky notes at Hobby Lobby. Sadie Robertson sets such a wonderful example for teen girls who have to navigate their faith in today's world. 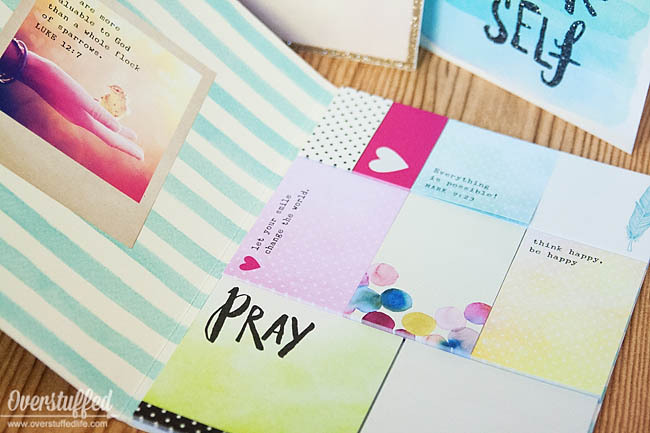 I appreciate that her products—notebooks, folders, greeting cards, and more—all feature Bible verses and the inspiring messages that my girls need to hear. 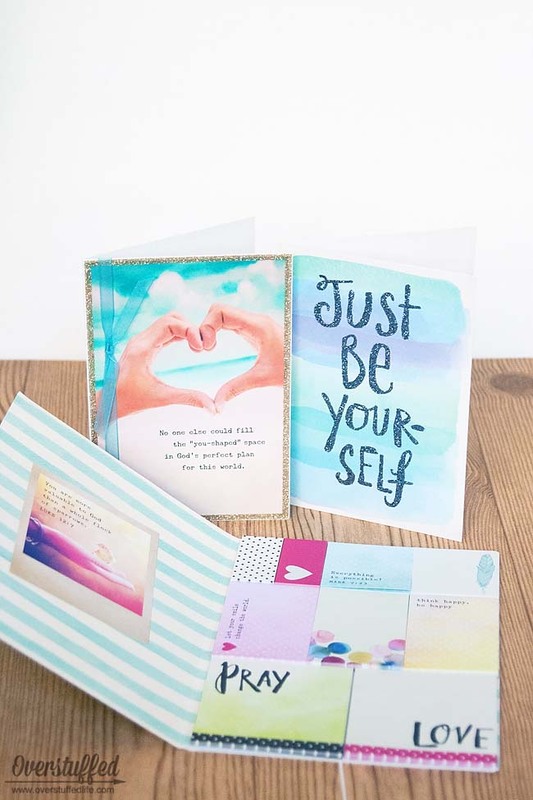 They appeal to teenage girls and I know my daughters have loved finding the encouraging sticky notes I've been leaving around the house for them lately—I know this because they rolled their eyes and didn't throw them away. 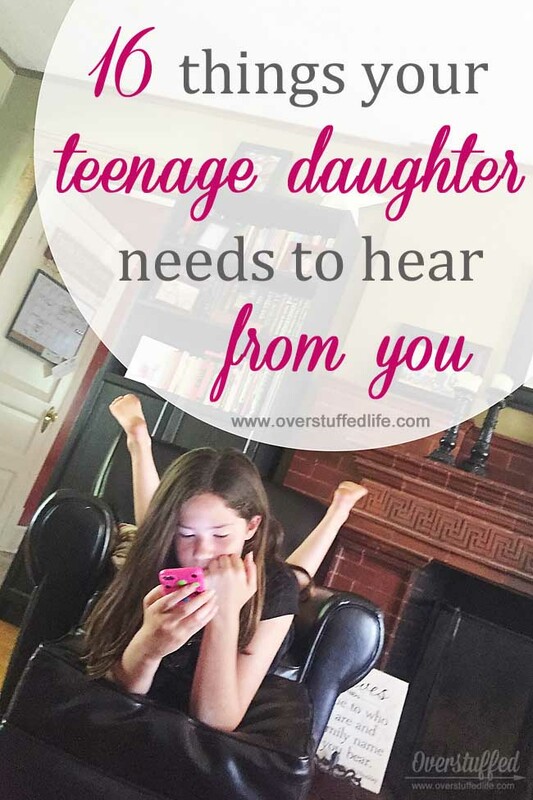 How do you encourage your teenage daughter?